Warm weather is just around the corner and you know what that means….it’s fiesta season! I am dreaming of long sunny days, warm temps, carefree schedules, and gathering with friends and family on my back deck to enjoy some yummy snacks….and wine of course! Everything about summer seems simpler. No early wake ups, lots of no-cook meals, and lots of time spent outdoors. Pretty perfect if you ask me! 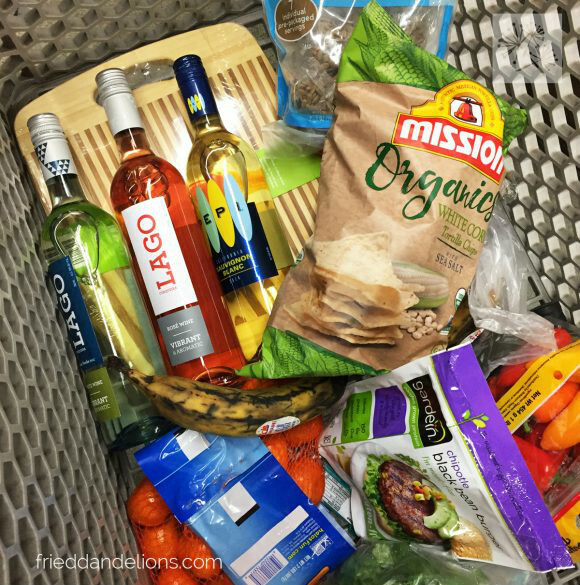 Last week I went to my local Grocery Outlet and was able to grab all of the components for a perfect fiesta at a major discount! 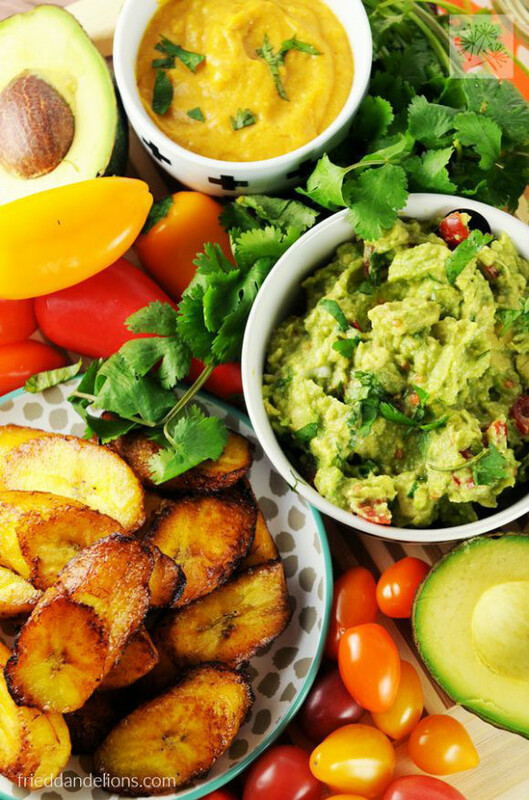 We’re talking avocados, plantains, organic tortilla chips, fresh veggies, and wine! Yep, WINE. They have a HUGE wine section with so many choices (use the handy website Barnivore to confirm that your wine choices are vegan)! I was so impressed with the prices—most of the bottles that I looked at were less than $5! For those of you who aren’t familiar, Grocery Outlet is a discount grocery chain that offers amazing deals on groceries, ranging from fresh produce to frozen goods, and even some housewares (like the bamboo cutting board in my pictures)! When I went last week I was able to grab some great basics! I always get a large bottle of the Chosen Foods brand avocado oil for a super steal, and my kids’ favorite ice cream—the So Delicious Neapolitan flavor. It comes in the big tub for just a few dollars! And they even have gardein products in the freezer! Check out the NOSH section—it’s my favorite. 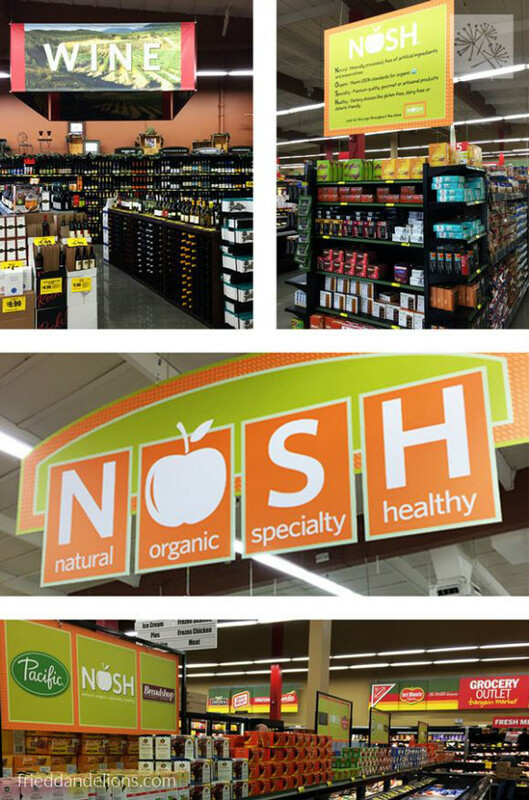 NOSH stands for Natural Organic Specialty Healthy and it’s exactly that. All of my favorite brands at a major discount.